Besides the ever-growing number of novels in the series which plot the main course towards the end of the world there are also a number of short stories and novellas available, pencilling in other details and side-threads. The series does not need to be read from the beginning – given its length Charlie has provided jumping-on points for readers joining in at a later date. 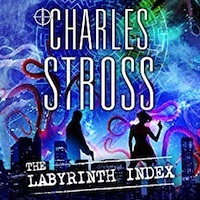 The Labyrinth Index, though, is not one of them. The new government is very much in favour of an exit from the EU, and isolationism. Firstly it will stop the right/wrong people leaving, but more to the point there are ulterior motives, not the least the fact that the Mandate is preparing for war, as he is not the only Elder God awakening. And so the Mandate sets up an Expeditionary force, under Mhari Murphy (now Baroness Karnstein, for political reasons) to disrupt this plot, put some sand in the gears of the Black Chamber's plans, and generally yank their chain a bit. There is not terribly much set-up – it's action stations from the go. Preliminaries, inasmuch as required, and other info dumps are told as flash-backs and other inserts to break up the progress towards the showdown. The pacing and timing of action/progress/information works rather well for me, so no complaint re. this approach! Given the gears-within-gears and Secret Agents/Tradecraft setup there is, as befits such a setting, some heavy double crossing and layers of need-to-know and ulterior motives and aims taking place. I'm not really sure how much of this is really on the main series story arc towards (presumably) the End of the World, and how much is a – frothy and entertaining is sometimes rather bloody (he is still rather rough on his protagonists; we are losing several. Nope, no spoilers!) detour into Secret Agent/Tradecraft Thriller territory. I felt that there was the odd hand-wave or cheap cop-out to keep the story moving and hanging together; albeit none were jarring enough to spoil my enjoyment. Overall one of the best-paced and enjoyable instalments in the series in a while, I hope this continues, in which case I'm not in a hurry to see the end of the world!